Kayla White of Bluffton dishes the pass after driving against the defense of Allen East’s Ally Richardson (3) and Lauren Criblez on Monday night during the Northwest Conference matchup at Bluffton. Libby Schaadt of Bluffton goes down the baseline to make her way under the basket against Allen East’s Lauren Criblez on Monday night during the Northwest Conference matchup at Bluffton. Lauren Criblez of Allen East goes to the basket against the applied defense of Bluffton’s Libby Schaadt on Monday night during the Northwest Conference matchup at Bluffton. 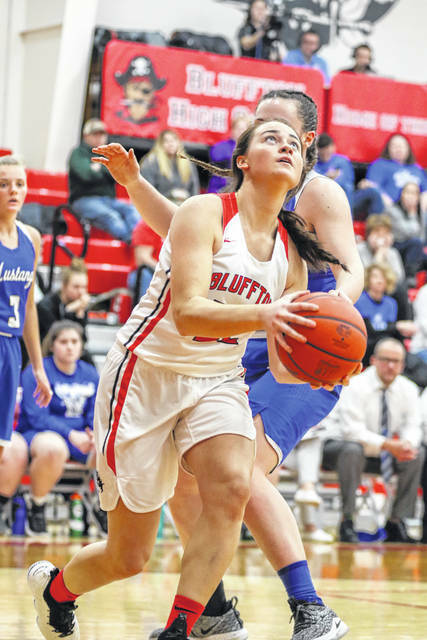 BLUFFTON – Bluffton senior Alivia Koenig knows she has the green light when she has the basketball on the perimeter. 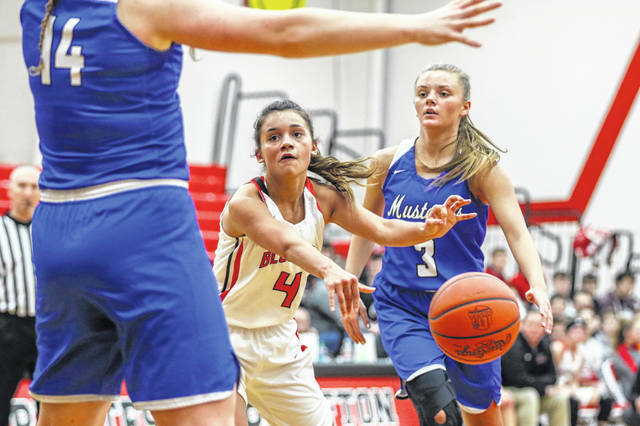 In Monday’s key Northwest Conference girls’ basketball matchup with visiting Allen East, there should have been a yellow caution light flashing when Koenig had the ball. 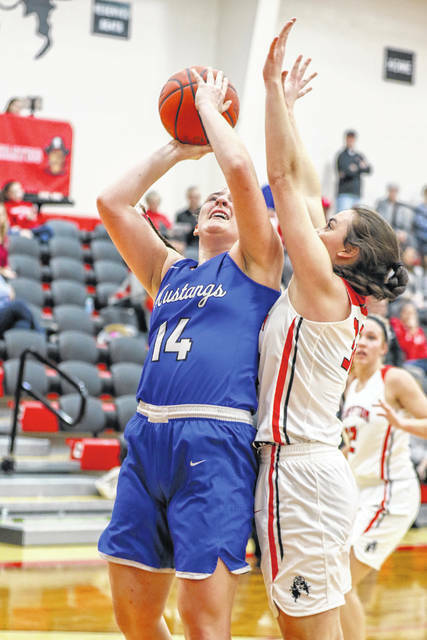 The Urbana University-bound Koenig scorched the Mustangs for five 3-pointers, including four bombs in the first quarter to set the tone for a 53-42 victory for Bluffton. Koenig ended the night with a game-high 17 points, while also dishing out four assists. When Allen East was finally able to slow Koenig down, Bluffton had other players step up. Along with Koenig, Bluffton had two others score in double figures. Libby Schaadt scored 14 points and came away with four rebounds. Averey Rumer had 11 points, five boards and five assists. Koenig said this year’s squad can score in a number of ways. Lauren Criblez, a 6-foot post player, led Allen East with 15 points, five rebounds and a block. Lakin Basham added 10 points for the Mustangs. With the win, Bluffton stays in the hunt for at least a share of the NWC title with a 6-1 conference mark and a 15-5 overall record. Coming into Monday’s action, Spencerville (6-1) and Columbus Grove (5-1) also had one blemish in conference play. Allen East slips to 13-7 overall and 4-4 in the NWC. Bluffton started the game on a 10-0 run. Koenig jump-started the Pirates, scoring her team’s first eight points of the game, including two 3-pointers. However, Allen East responded, going on an 8-0 run and cutting the deficit to 10-8, with less than two minutes to play in the first quarter. However, the Pirates closed out the quarter on an 8-2 run to grab a 20-10 lead by the first stop. Koenig scored 14 first-quarter points, including four shots behind the arc. In the second stanza, Allen East managed to hold Koenig to just one field goal attempt and no points. However, Rumer stepped up and scored six second-quarter points for the Pirates. Rumer also dished out four assists in the first half. Bluffton took a 32-19 lead into the halftime break. The Pirates were 13 of 22 shooting from the floor for 59 percent, while the Mustangs connected on 8 of 21 from the field for 38-percent shooting. The Pirates came out of the locker room and pushed its lead to 38-19 within the first two minutes. Bluffton led 42-28 at the end of the third quarter. Schaadt led the Pirates with six third-quarter points. Garmatter has been pleased this season on how his team has shared the basketball. For the game, Bluffton shot 53 percent from the field. Allen East connected on 38 percent of its field goal attempts. On the night, each team turned the ball over 12 times. Allen East held the slight edge on the boards, 26-24. Bluffton will play Pandora-Gilboa tonight and then face Delphos Jefferson Thursday, which will wrap up both conference play and the regular season. “We have to take care of our business. We will let everyone else worry about themselves. If we win, we get at least a share of it,” Garmatter said. https://www.limaohio.com/wp-content/uploads/sites/54/2019/02/web1_Allen-East-vs-Bluffton-GBB-4639-1.jpgKayla White of Bluffton dishes the pass after driving against the defense of Allen East’s Ally Richardson (3) and Lauren Criblez on Monday night during the Northwest Conference matchup at Bluffton. https://www.limaohio.com/wp-content/uploads/sites/54/2019/02/web1_Allen-East-vs-Bluffton-GBB-4678-1.jpgLibby Schaadt of Bluffton goes down the baseline to make her way under the basket against Allen East’s Lauren Criblez on Monday night during the Northwest Conference matchup at Bluffton. https://www.limaohio.com/wp-content/uploads/sites/54/2019/02/web1_Allen-East-vs-Bluffton-GBB-4522-1.jpgLauren Criblez of Allen East goes to the basket against the applied defense of Bluffton’s Libby Schaadt on Monday night during the Northwest Conference matchup at Bluffton. This entry was tagged allen east, Bluffton. Bookmark the permalink.